HOT DEAL: Amazing boutique resort. With specials on 3 day and 7 day packages going on now. 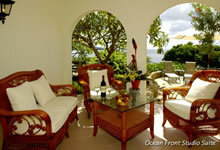 Get your Free Quote and see how "beautiful" Curacao really is. Age Restrictions: Children under the age of 12 are free if no additional bedding is required. Price Includes: Depends on which of several available packages are purchased. Lodge Kura Hulanda is a collection of Caribbean inspired two-story buildings. Rooms are tiled and feature light rattan furnishings and colorful cushions that lend a tropical flair. Premium bedding includes 300-thread Egyptian cotton sheets and comforters. High-speed Wireless Internet access is complimentary. All accommodations include CD player/radio, ceiling fan, remote controlled air-conditioning, in room safe, cable/satellite TV and entertainment system with DVD player are standard in all of the Ocean Front accommodations and Lodge Garden View Suites. Additionally, all accommodations include: Welcome drink on arrival; Complimentary daily newspaper; Complimentary admittance to Fitness Center; Chaise lounges at pool and beach; nightly turn down service; Complimentary scheduled transportation to Hotel Kura Hulanda Spa and Casino – a 40 minute ride through the scenic countryside of Curacao. Kitchenette includes two-burner stove, sink, microwave, small refrigerator,coffemaker and toaster. Most studios and suites can be connected for larger families. Non-smoking accommodations are also available. 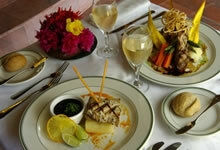 The resort’s main restaurant features local and international specialties – open for breakfast and dinner. Guests dine under an expansive, open-aired, thatched roof hut while enjoying tropical cross breezes and sweeping views of the sea. Dining cliffside with a panoramic view of the ocean offering international and local fare for lunch – located next to the Christoffel Sunset Lounge. Enjoy the best sunsets on the Caribbean here! Opened daily for lunch, offers a relaxing beachside atmosphere and a splendid view of the sea. Guests dine on light, casual lunchtime fare while dining on the sandy beach. Also a great place to enjoy your favorite beverage while sun bathing. Enjoy a BBQ dinner on Wednesdays, Fridays and Saturdays. adjacent to the Watamula Restaurant and the swimming pool. A casual lounge featuring panoramic unobstructed ocean views, refreshing drinks, snacks, entertainment and a big screen TV to watch your favorite sports. Three meals daily (some items on the A La Carte Menu are a surcharge). House brand beverages, soda and juices. Must be purchased for entire stay. Children ages 2-11 are entitled to 50% discount on all meal plans. You can get just Breakfast and Dinner using the Modified American Plan (MAP) if you want to get lunch on your own. Remember, the rooms do have a kitchette. The free form swimming pool is set on the cliff next to the ocean with steps leading down to the beach, and features stunning views – beverages and snacks are available through the Christoffel Sunset Lounge – complimentary sun beds, towels and umbrellas are available to offer shaded areas. The resort also features a beautiful white sandy beach with crystal clear blue calm water. A natural reef is located just a few meters off shore. Drinks and lunch are available at the Kalki Beach Bar and Grill. The dive shop is also located here to meet all your diving, snorkeling and water sports needs. Water sports that are offered are kayaks, paddleboats, sunfish boats along with sun floats. 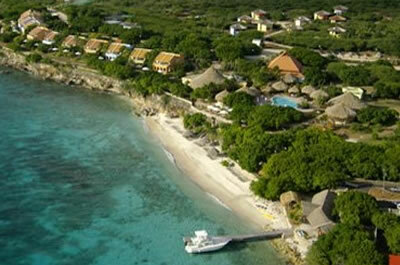 Curacao is one of the Caribbeans top rated dive spots and Lodge Kura Hulanda is one of the top dive resorts in Curacao. 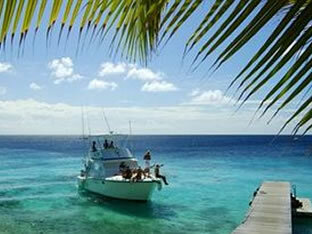 Lodge Kura Hulanda offers diving through PADI certified Ocean Encounters West, situated on property. Guests may enjoy this fully equipped, on-site dive shop that will arrange a wide assortment of diving courses and excursions. From resort to master dive courses, Ocean Encounters West offers PADI courses for all levels of experience. Equipment rental and filling stations are also available.